I've been saying this to a few people lately, but it's really funny how your mindset can change in a matter of a couple of months. December and January were hard months for me (mostly for personal reasons, but some business reasons too.) Lots of things started to change for the better in February, so I can't credit any one thing for my new positive attitude, but I'm really happy to be happier. I'm exercising a lot more, my vision has become a little more stable, and I'm talking to more people. They seem like simple things, but I'm not taking them for granted because they mean so much. So much has happened in the past week! I took a brief trip down to New York to meet up with these two lovely ladies and I had a great time! I can't wait to see both of them again. Sometimes I can't believe how fortunate I've been to meet so many amazing people through this blog. Okay, maybe I'm being a little sentimental here, but it's all true! There is one more thing that's happening right now that I'm so excited about, but I'll tell you more when things are set in stone - I don't want to jinx it! There are some business changes afoot and I can't wait to let you in on that. 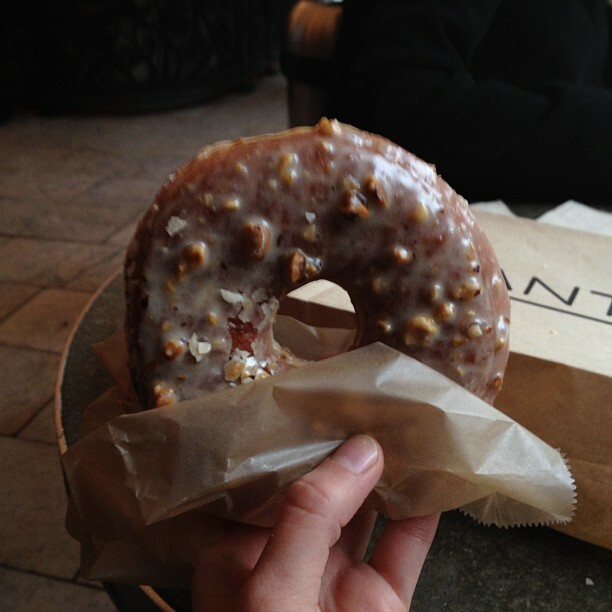 Oh, and that's a hazelnut donut from the Donut Plant in New York. I could eat one every day.